Azure Active Directory Domain Services includes built-in Group Policy Objects (GPOs) for the 'AADDC Users' and 'AADDC Computers' containers. 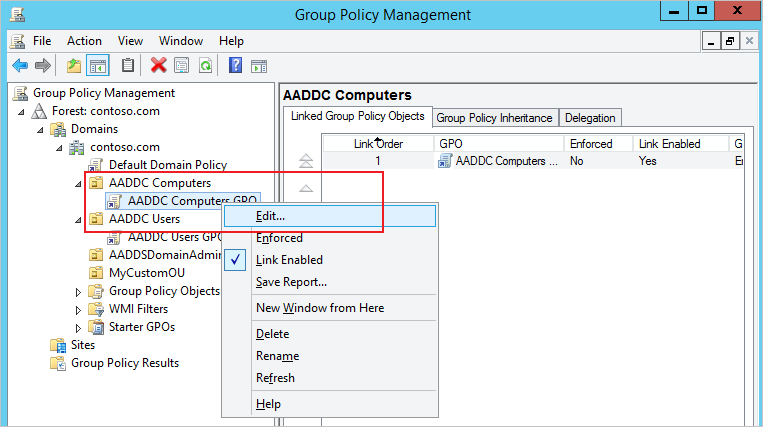 You can customize these built-in GPOs to configure Group Policy on the managed domain. Additionally, members of the 'AAD DC Administrators' group can create their own custom OUs in the managed domain. They can also create custom GPOs and link them to these custom OUs. Users who belong to the 'AAD DC Administrators' group are granted Group Policy administration privileges on the managed domain. A domain-joined virtual machine from which you administer the Azure AD Domain Services managed domain. If you don't have such a virtual machine, follow all the tasks outlined in the article titled Join a Windows virtual machine to a managed domain. You need the credentials of a user account belonging to the 'AAD DC Administrators' group in your directory, to administer Group Policy for your managed domain. Azure AD Domain Services managed domains can be managed remotely using familiar Active Directory administrative tools such as the Active Directory Administrative Center (ADAC) or AD PowerShell. Similarly, Group Policy for the managed domain can be administered remotely using the Group Policy administration tools. Administrators in your Azure AD directory do not have privileges to connect to domain controllers on the managed domain via Remote Desktop. Members of the 'AAD DC Administrators' group can administer Group Policy for managed domains remotely. They can use Group Policy tools on a Windows Server/client computer joined to the managed domain. Group Policy tools can be installed as part of the Group Policy Management optional feature on Windows Server and client machines joined to the managed domain. 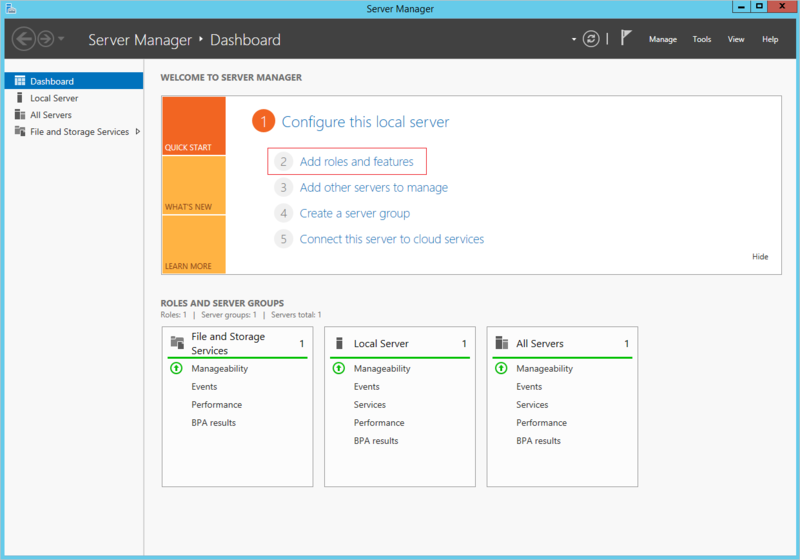 The first task is to provision a Windows Server virtual machine that is joined to the managed domain. For instructions, refer to the article titled join a Windows Server virtual machine to an Azure AD Domain Services managed domain. Perform the following steps to install the Group Policy Administration tools on the domain joined virtual machine. Navigate to the Azure portal. Click All resources on the left-hand panel. Locate and click the virtual machine you created in Task 1. Click the Connect button on the Overview tab. A Remote Desktop Protocol (.rdp) file is created and downloaded. To connect to your VM, open the downloaded RDP file. If prompted, click Connect. At the login prompt, use the credentials of a user belonging to the 'AAD DC Administrators' group. For example, we use 'bob@domainservicespreview.onmicrosoft.com' in our case. You may receive a certificate warning during the sign-in process. Click Yes or Continue to proceed with the connection. From the Start screen, open Server Manager. 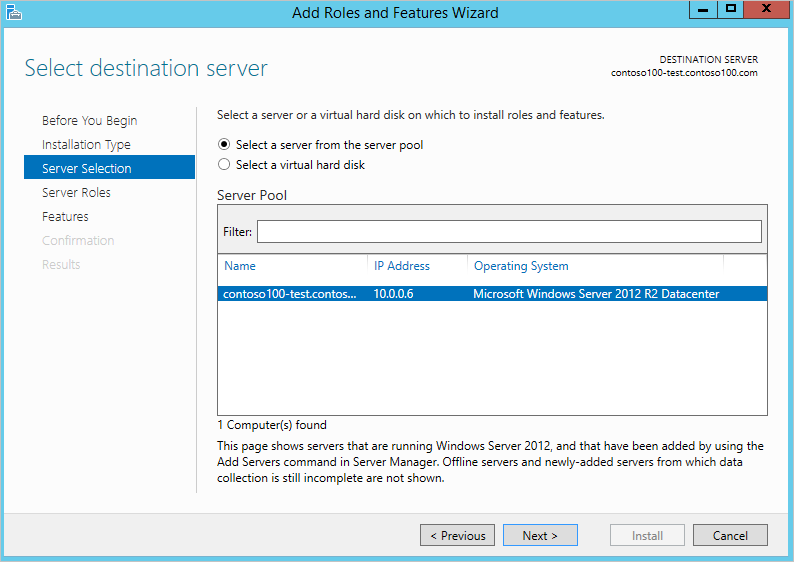 Click Add Roles and Features in the central pane of the Server Manager window. 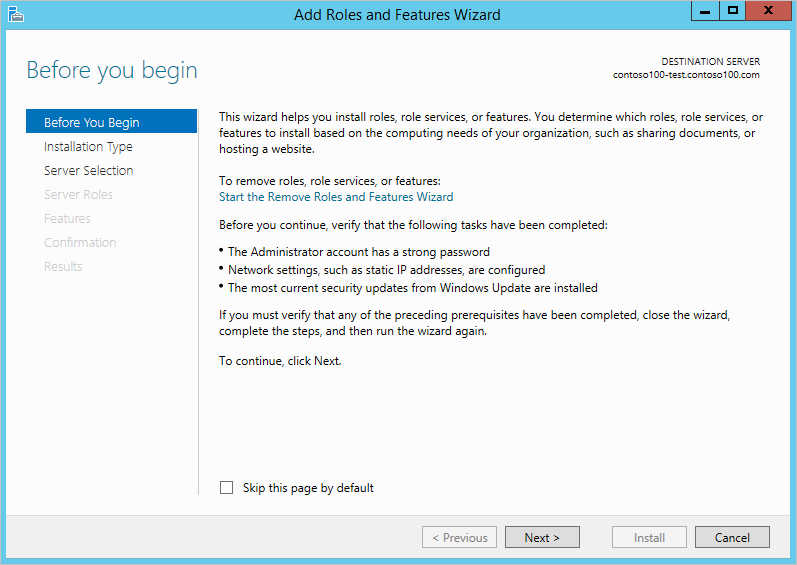 On the Before You Begin page of the Add Roles and Features Wizard, click Next. 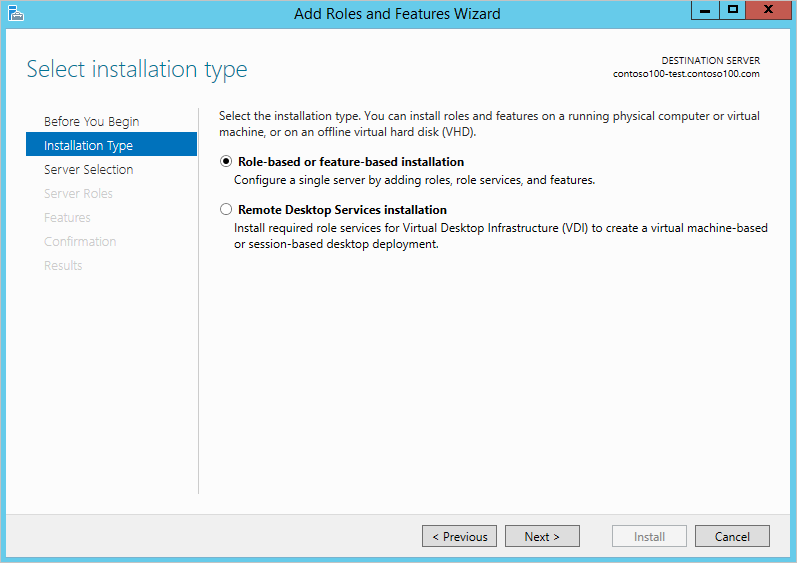 On the Installation Type page, leave the Role-based or feature-based installation option checked and click Next. On the Server Selection page, select the current virtual machine from the server pool, and click Next. On the Server Roles page, click Next. We skip this page since we are not installing any roles on the server. 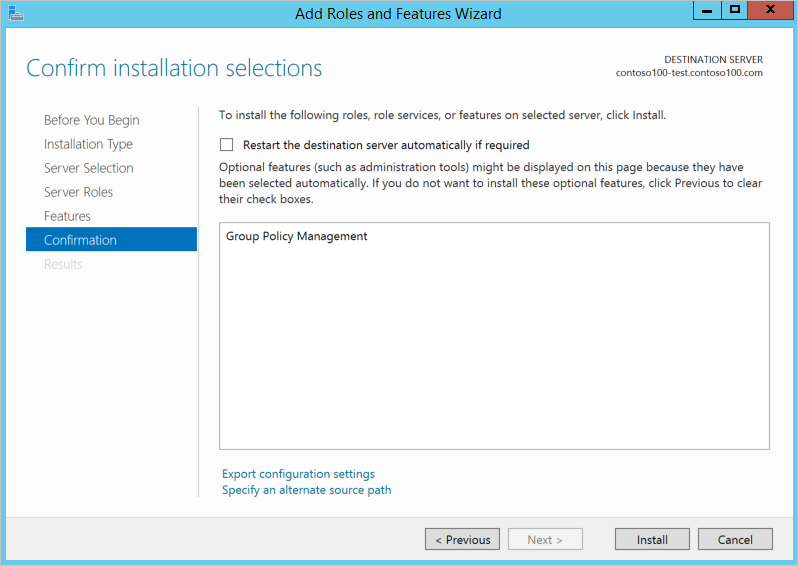 On the Features page, select the Group Policy Management feature. On the Confirmation page, click Install to install the Group Policy Management feature on the virtual machine. When feature installation completes successfully, click Close to exit the Add Roles and Features wizard. You can use the Group Policy management console on the domain-joined virtual machine to administer Group Policy on the managed domain. You need to be a member of the 'AAD DC Administrators' group, to administer Group Policy on the managed domain. From the Start screen, click Administrative Tools. You should see the Group Policy Management console installed on the virtual machine. Click Group Policy Management to launch the Group Policy Management console. 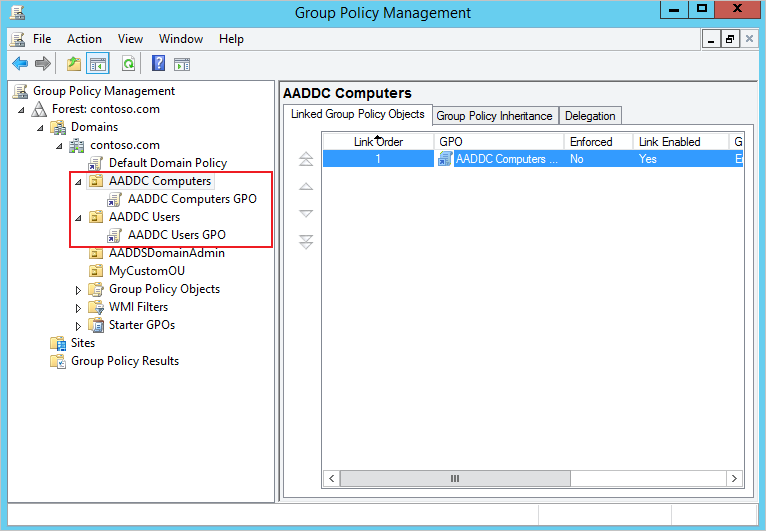 There are two built-in Group Policy Objects (GPOs) - one each for the 'AADDC Computers' and 'AADDC Users' containers in your managed domain. 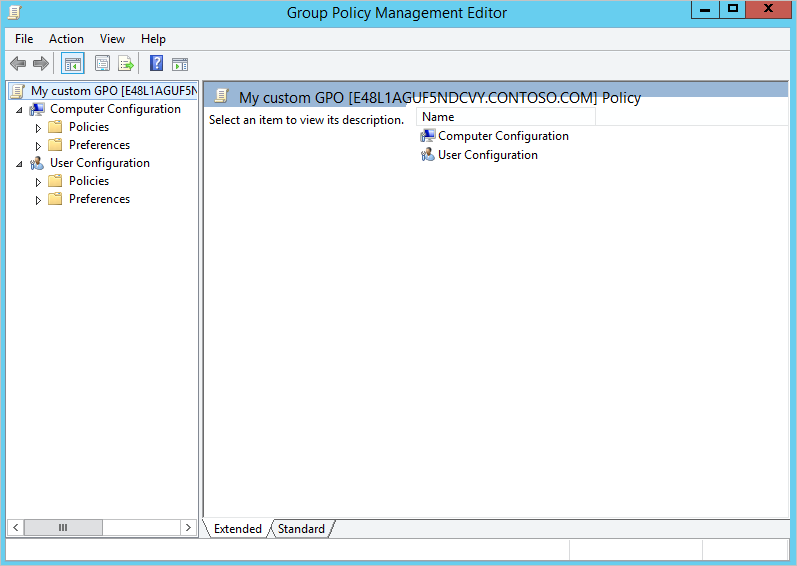 You can customize these GPOs to configure group policy on the managed domain. 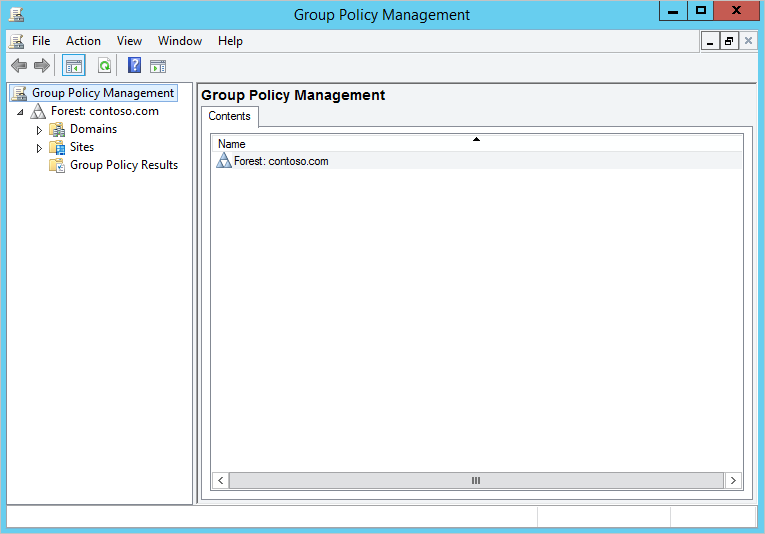 In the Group Policy Management console, click to expand the Forest: contoso100.com and Domains nodes to see the group policies for your managed domain. 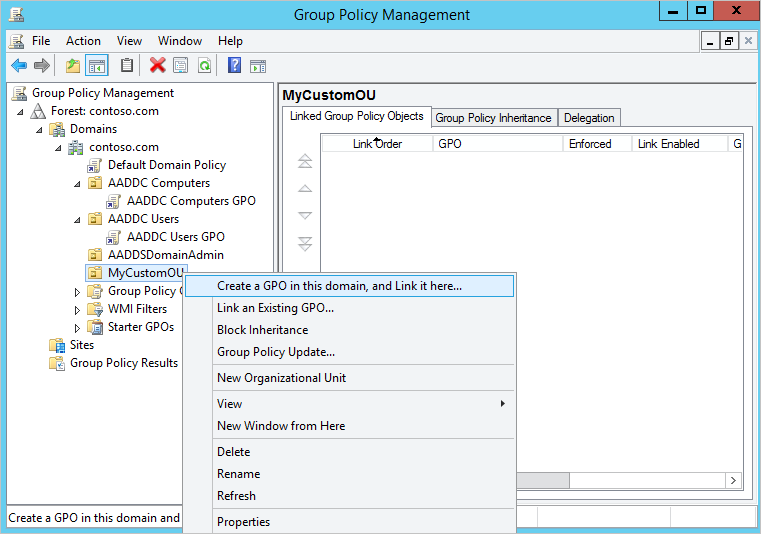 You can customize these built-in GPOs to configure group policies on your managed domain. Right-click the GPO and click Edit... to customize the built-in GPO. 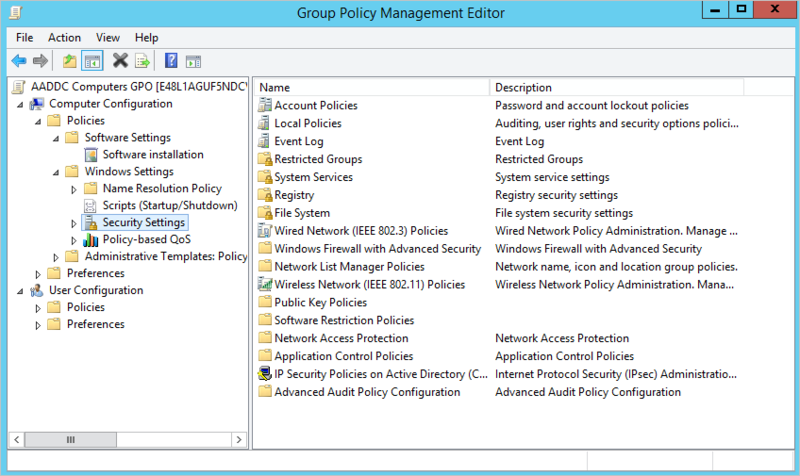 The Group Policy Configuration Editor tool enables you to customize the GPO. You can now use the Group Policy Management Editor console to edit the built-in GPO. For instance, the following screenshot shows how to customize the built-in 'AADDC Computers' GPO. You can create or import your own custom group policy objects. You can also link custom GPOs to a custom OU you have created in your managed domain. For more information on creating custom organizational units, see create a custom OU on a managed domain. Specify a name for the new GPO and click OK.
A new GPO is created and linked to your custom OU. Right-click the GPO and click Edit... from the menu. 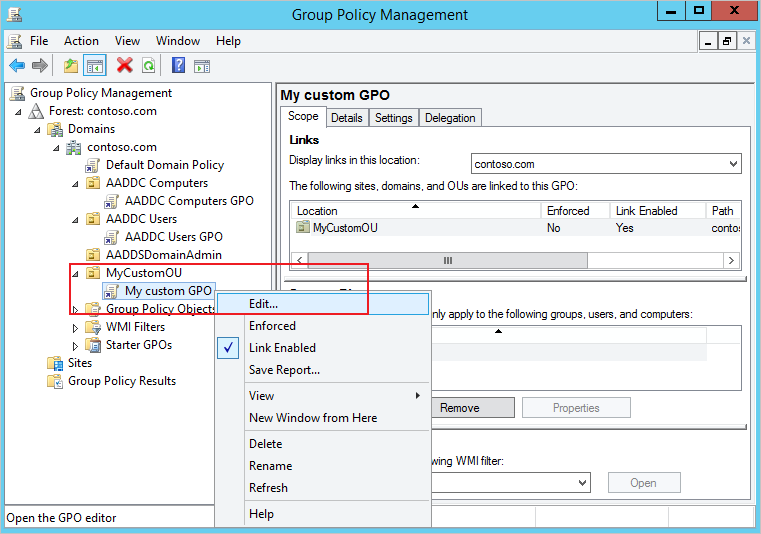 You can customize the newly created GPO using the Group Policy Management Editor. 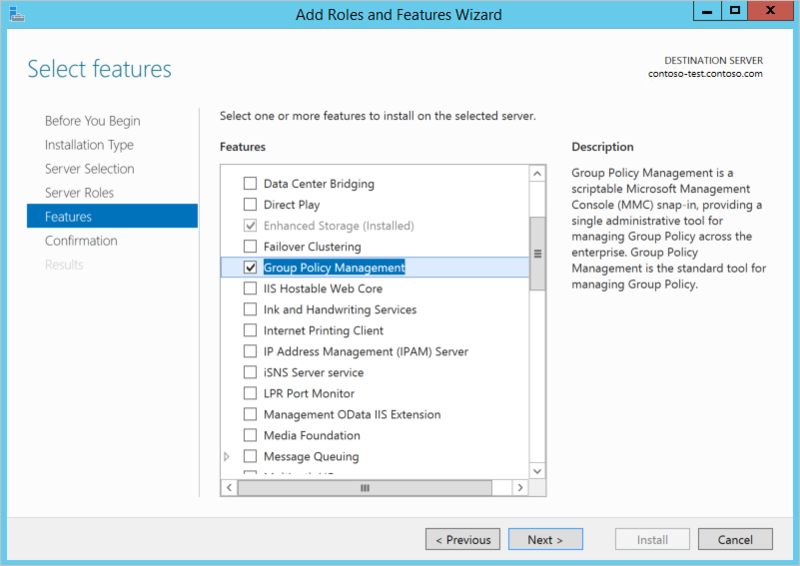 More information about using Group Policy Management Console is available on Technet.